Rox Zero is a strong addition to the Rox product lineup. The flavor is sweet and has very little aftertaste. With only 10 calories and 1 gram of carbohydrate per serving, this is an extremely attractive product to calorie/carb-conscious consumers. 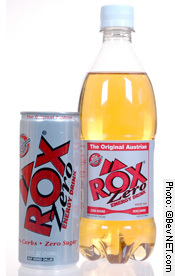 As far as the packaging goes, it follows the same clean style that is found in the original Rox. Overall, Rox has done a really good job with Rox Zero -- it's definitely worth a try.